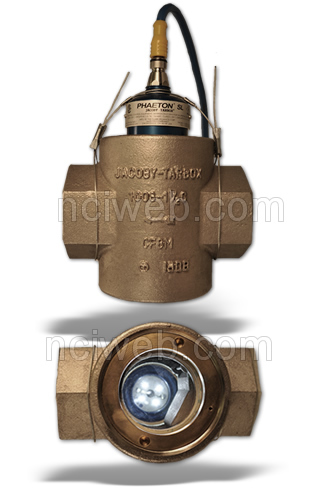 Standard Jacoby Tarbox ® sight flow indicators can be specified to accommodate very specific application requirements. Special Jacoby Tarbox ® indictors can be designed and manufactured to meet unique installation, processing or flow criteria. Specifiers may choose from a wide range of indicator body materials, gasket materials, glass types and window designs, plus special corrosion-resistant lined indicators. This unit employs a 316SS hinged wheel weighted flapper to indicate flow media. The velocity of the flow is indicated by the position of the flapper. Uni-directional, these units are optimal for horizontal or vertically upward flows. These units are bi-directional and may be placed in any orientation. Used primarily in processes where spot indication is desired to detect presence of media, or to inspect color, clarity, turbidity, or other critical characteristics. Connection sizes range from 1/8" fnpt to 2" fnpt. Independently threaded retainers machined from corrosion resistant alloys. Annealed borosilicate glass. NOT soda lime like some competitors ! Hex ends on bodies allow for easy installation. All ASTM listed body materials. High Temperature (1000ºF) finish on steel and iron bodies. Stainless steel engraved identification tag wired to unit. All units hydro-tested at 1-1/2 times rated pressure. Are rated for over 10 years continuous duty... no need to turn on and off. Consume less than one amp... so they stay cool enough to touch even when on. Illuminate with cool light, keeping product from baking on the window. Require no maintenance. Need to clean it? Unclip and wash...no need to disconnect.